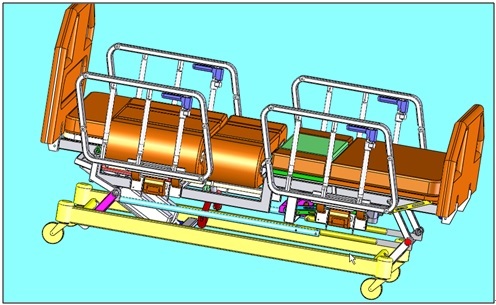 A multifunctional full-automation care bed is formed of a chassis (1), a bed frame (2), a head board (9), a back board (7), a buttock board (6), a leg board, a foot board (3), double folded restraining sides, and a toilet fold mechanism. The back board and the buttock board are rotatable hinged boards, whose corresponding cushions are cylindrical cushions and move synchronously with the hinged boards. The back board and the buttock board are divided into three pieces longitudinally. The two pieces at the sides can fold upward, respectively. When one side board at one side is folded, the hinged boards and the rolling cushion move to the direction of the folded board, and a patient can turn over at 0 to 360 degrees. The toilet fold mechanism is installed below the leg board at the rear part of the bed frame. The middle piece of the leg board can rise driven by an electric push rod and support the legs of a patient and enable the buttocks to leave the cushion. A toilet (35) can automatically move below the buttocks of the patient as driven by the fold mechanism. The care bed is driven by a motor and eight electric push rods and is controlled by a microcontroller. A. What is the kind of this product? Hospitals, rehabilitation centers and nursing homes. About automatically of less than 90 degrees sideways, and 360 degree scrolling to turn functionality; Automatic defecate processing functions. Nursing care market is a very big market. But now the lack of nursing staff, tired and dirty with due care, no one is willing to engage in nursing. In the course of nursing, very few devices can be used to care mainly artificial nursing, so patients need male nurses with heavier body weight. This patented innovation for nursing is to provide an entirely new principle of rolling turn over, and after 10 years of improvements and refinements can be for the commercial production of products at once. More than 90% this patent reduces the intensity of work, make the most of the nursing work done automatically by the machine, but also to maximize the patient's quality of life. Caused by a variety of reasons such as a car accident, disease, and trauma: paraplegic patients, loss of the ability of exercise (older) people, vegetative state and other bedridden patients. The multifunctional automatic care (turn over) bed is from the shoulder to the hip of the baseplate designed chain type. Vertically divided into three blocks, on both sides of each of the two blocks can be folded, chains continuous horizontal rotation, it would allow patients around doing stand up action at any angle, always in a position in the middle of the bed, safe and reliable. It turned things around and made patients just like our normal turned things around, backs fully left the bed, completely solve the bedsores. When patients stood up on the bed is a rolling process, so its greatest extent improved the patient's blood circulation and increases intestinal peristalsis. After the automatic nursing bed Slatted bed base, lift toilet designs below, rises in the bed legs can hold up when the patient's hip, opens a space toilet in linear actuator driven by toilet can be forked into the patient's buttocks, addressing bedridden patients ' bowel problems. All this is done automatically by the electronic control. Appearance of the multifunctional automatic care (turn over) bed bed size and other features, exactly like the medical bed now. a)	Completely solve the automated turn over and automated processing of defecation in nursing work; between bed to bed lateral transfer function. b)	Completely prevent bedsores and bed patient's quality of life has greatly improved. c)	The maximum reduce the nursing work and human cost. In practical nursing work for turning over bedridden patients is essential and onerous task, part for the heavier weight bedridden patients turning over needed two or three people as well as coordinating to complete, it is a very heavy workload; and for some critically ill patients incorrectly turn over may cause secondary injuries. For bedsores patients there are three aspects of turning over: 1, prevent bedsores; 2, Improve blood circulation; 3, Increases intestinal peristalsis, improving digestion and bowel function in patients. Now 60% of elderly bedridden patients died because bedsore infection with complications, if we can solve the bedsores can prolong patients' lives and improve the quality of life. Many countries entered the aged society in the world. China's elderly population has more than 100 million people, according to the Chinese Ministry of civil affairs in 2007 32.5 million older persons in need of long-term care. Social development at the same time increase the number of natural disasters, accidents increased. June 4, 2007 at the 4th National Conference on injury prevention and control, published by China research report provides data on injuries, at least 200 million people injured each year, 700,000 people were killed and 1 million people permanently disabled. Due to improvement of living standards worldwide cardiovascular disease also increases. 2005 number of cardiovascular disease in China, and accounted for second of all disease, all at least half of them need to be ridden, so nursing care is a very big market. 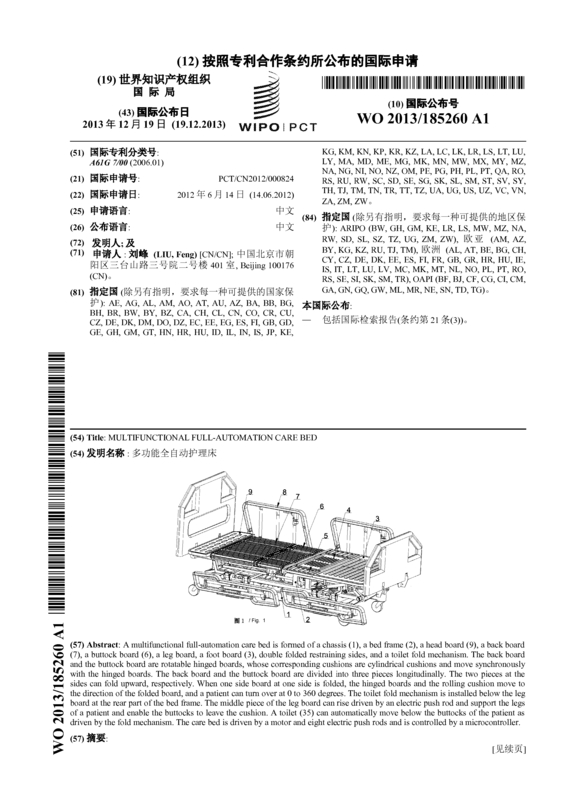 Page created at 2019-04-22 14:45:16, Patent Auction Time.